JFrame is a top-level container that is used to hold components in it. These components could be button, textField, label etc. The default layout of JFrame by which it positions the components in it is BoderLayout manager. public JFrame() Creates a JFrame window with no name. 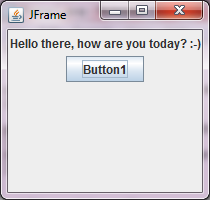 public JFrame(String name) Creates a JFrame window with a name. public void add(Component comp) This method adds the component, comp, to the container JFrame. public void setLayout(LayoutManager object) This method sets the layout of the components in a container, JFrame. public void remove(Component comp) This method removes a component, comp, from the container, JFrame. public void setSize(int widthPixel, int heightPixel) This method sets the size of a JFrame in terms of pixels. public void setVisble(boolean b) This method set the visibility of JFrame using boolean value. BorderLayout is the default layout manager of JFrame. The default layout of JFrame by which it positions the components in it is BoderLayout manager. Hence, if we add components to JFrame without calling it's setLayout() method, these components are added to the center region of by default. Note : Remember, using the BorderLayout manager, only one component can be placed in a region, hence if multiple elements are added to a region, only the last element will be visible. 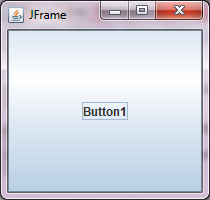 //Adding JLabel and JButton to JFrame, which will added to BorderLayout.CENTER region of JFrame. In the last code, two components i.e. JLabel and JButton are added top-level container, JFrame, without calling its setLayout() method. These components are added to BorderLayout.CENTER region of JFrame. Hence, only the last component added, i.e. JButton will be visible. When you run the code, you are presented a window that only shown a button. A simple example of JFrame with FlowLayout manager. In the upcoming code, we are going to add two components i.e. JLabel and JButton to JFrame. A JLabel displaying a message. A JButton displaying a button.